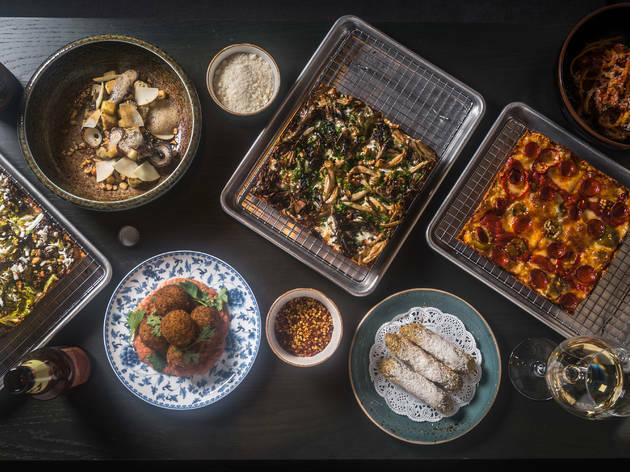 “Italianish.” It’s a word thrown around with great frequency at Massoni, the graffiti-tagged new arrival at the Arlo NoMad hotel from celebrity chef Dale Talde and his Three Kings Restaurant Group. Servers are quick to drop it during their tableside selling of gimmicky starters like small arancini balls built with biryani ($12)—the cardamom-and-curry zing is too subdued in the rice, but a side of yogurt-addled tomato sauce adds some necessary zing—and pistachio-crusted cannoli tubes piped with beef tartare ($16). 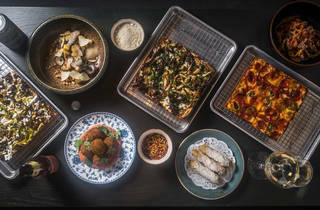 It’s the same sort of dance around the word fusion that the Filipino-American chef and his team perform at his eponymous Park Slope restaurant Talde, where yuzu guacamole, bacon pad thai and everything-spiced roti bread are billed under the guise of “inauthentic Asian.” But fusion it is, and no dish at Massoni goes untouched, no convention overturned. Some instances of that tampering work better than others. The pair of salads underwhelm: The house Caesar features the obligatory romaine and salty Parmesan, but a web of nori flakes, subbing in for the usual anchovy, overwhelms the plate with algae funk ($14); a toss of Tuscan kale, however, could use more of that pesce saltiness, but instead its smoked-saba sauce gets lost in the many sugars of green papaya and persimmon ($15). Pastas, such as goat cheese gnudi with a vaguely New American dressing of green apples, mushrooms and hazelnut ($23), are less winking and more straightforward. Wide, inky-black ribbons of pappardelle come coated in a crab vodka sauce that could use a great deal more meat ($25), and the only update to an otherwise lackluster twirl of bucatini all’amatriciana are cubes of bacon in place of more traditional pancetta ($22). In one of the best pasta years in recent memory, we’ve seen these kind of low-pitch liberties taken before, and better, elsewhere. And the pizza, more overtly so: Talde & Co. issue near replicas of the Detroit-style pan pies from Emmy Squared that blew up New York’s za scene last year. They’re good dupes, with similarly crispy crusts meshed in baked cheese, gonzo toppings—like charred brussels sprouts with pistachio pesto ($17) and clams with bacon and potato ($18)—and even the same plating, set on sheet pans atop wire cooling racks. The pepperoni pie ($17) has particular pluck, with its porky rounds curling up against pickled peppers and drizzles of honey, but it pales in comparison to Emmy’s Roni Supreme, still so fresh in the city’s collective pizza conscious. For all of its claims of novel reinventions, much of Massoni feels reductive. It’s close but not quite—it’s ish. 11 E 31st St (212-951-1141, massoninyc.com). Average pizza: $17.